To travel is to experience the local raw food material, spices and coziest restaurants. Zanzibar has a lot to offer in terms of food inspired by Africa, Persia and India. Tuna, Red Snapper, Kingfish, lobster and other treasures from the Indian Ocean are ubiquitous. The spices from this spice island are fresh and bursting of flavors – each restaurant has their own spice mixes. Rice is eaten to most dishes and has a great number of variations worth trying. 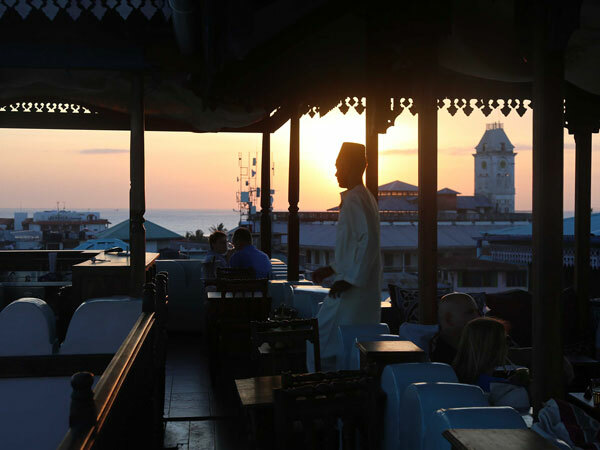 lovezanzibar has its favorite restaurants, for various reasons. Some have the best view. Best atmosphere. Or most inspiring menu. Lazily reclined on cushions on the floor you will listen to the city’s call to prayer, enjoying 270 degrees sea view. Tingling sounds suddenly appears from the Shiva temple below. As if this matchless atmosphere were not enough it is served up a three-course meal where the kitchen experiments with ingredients in season and Zanzibar meets Europe in innovative new dishes. Pre-order and come at 18:00 to enjoy the sunset. The best of two worlds- Zanzibar and Italy. Here we always eat home cooked ricotta ravioli with sage butter sauce. With unbeatable charm and service from the staff and interesting menu, this is the place we return to again and again. Always a nice mix of local, expats and tourists and open 7:00 to 10:00 makes this an ever-present option for coffee / lunch / dinner. Best juice in town and fresh coffee at the grandmother’s way. Nice rooms, they also have around 80 usd / night double. The smiles and the lovely atmosphere is just a bonus in this place with giant cakes and home roasted coffee from their own coffee plantation in Mbeya, Tanzania. Nice design they have too and you can buy their rewarded coffee to bring home. Most cozy atmosphere in Jambiani with obscenely large sofas. They also understand the importance of serving wine and beer in thin delicate glass- much appreciated. On the down side is that the dishes served does not comply with the promising given when reading the voluminous and innovative menu. Worth a meal, however, because it is simply so cozy. The Rock Restaurant is known to be on a small little rock in the middle of the ocean. Looks cool and gives nice pictures- but that is about it. Better eat at Upendo opposite and enjoy the view of The Rock. Hassan is educated in Europe and after various jobs at Zanzibari hotels, he opened his own place in the south of Jambiani. No that cozy but his Beurre Blanc is to die for. If you want to try some of his local food try our favorite “Kuku (chicken) ya kupaka” or ” Samaki (fish) ya kupaka” both made in a divine coconut sauce that should not be missed. A place for little some extravagance – if you want. Amazing view and atmosphere, and if you ever should drink a cocktail – this is the place. You can certainly test all of the Z Hotels many bars, cafés and restaurants. Very cozy hotel but also a consistent and interesting menu served with care and love about details, while you look out over the Indian Ocean’s azure waters. 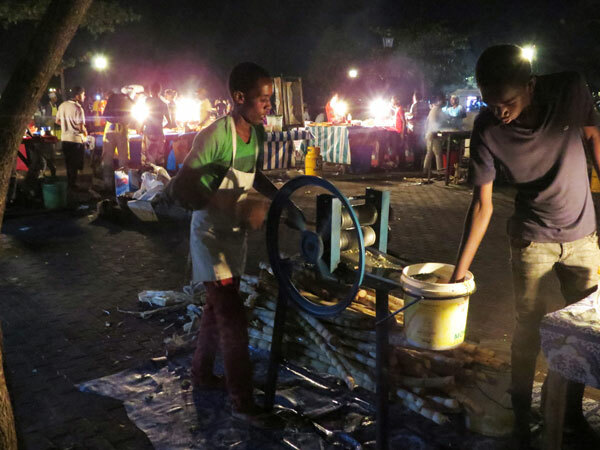 And so – Forodhani Park, Stone Town. In the evenings, the city’s residents come here to eat and socialize. At 17 the youth of the town come here to impress each other with various water jumps. The food may not be on top – it’s more the atmosphere that is the thing. If you ant to eat choose something that is cooked in front of you: the shwarma and Zanzibar pizza. Or be content with a cup of Spice Tea at Babu Chai. 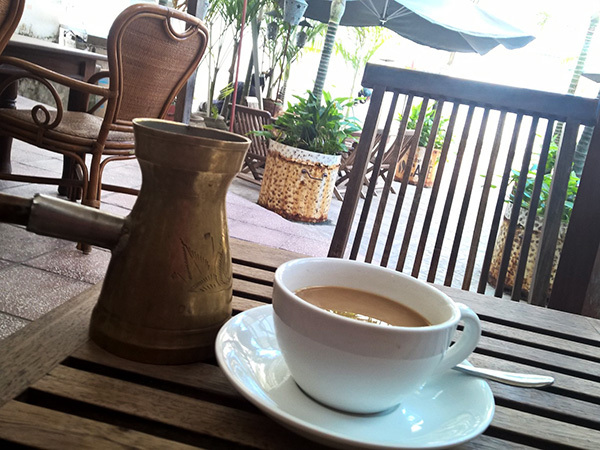 The Zanzibar Coffee House has really good food and coffee. The smell of the coffee IS wonderful and they have fresh pastries.